If you stumbled upon a pair of well-worn cowboy boots on Acton peninsula, you’d probably think some unlucky punter had left them behind. Not so if you found that pair in the Australian Institute of Aboriginal and Torres Strait Islander Studies (AIATSIS). 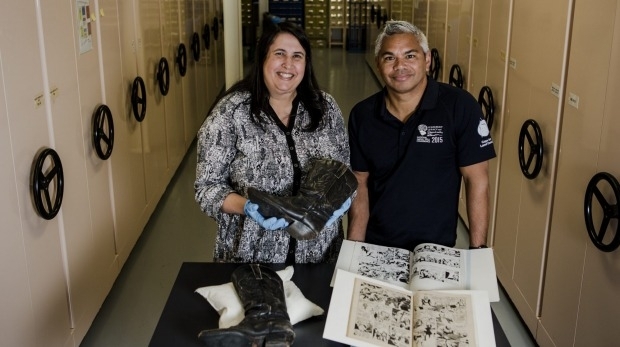 The boots, worn by Australian actress Deborah Mailman in her breakout role as Nona in the 1998 independent film Radiance, are just one of the treasures housed by the institute, which catalogues the history and culture of Indigenous Australians. The dusty boots were listed among the 10 most interesting finds in Canberra libraries, compiled by the Australian Library and Information Association. But AIATSIS is much more than a library, curator Alana Garwood-Houng said. “Our collections are print, audio, film, photographs as well as art and objects,” Ms Garwood-Houng said. Among their collections are many objects that form part of the wider story of Indigenous people, including a Phantom comic book in Warlpiri, one of the most widely spoken Aboriginal languages. The comic, which hailed from the central desert, tells a story of slavery, Ms Garwood-Houng said. “What the community did was they took elements of the Phantom comic and put them in their own version to tell their own stories,” she said. Ms Garwood-Houng said comics were used by educators and even government agencies as a tool to connect with Aboriginal communities. “Phantom comics were passed around the communities, I had my own personal Phantom collection at home,” she said. A Phantom-esque hero, Condoman, was even created to stem the spread of AIDS and other sexually-transmitted diseases within Indigenous communities in the 1980s. 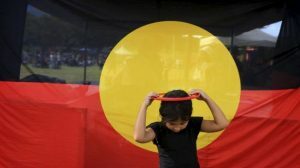 Comics are still used as a tool to encourage Aboriginal and Torres Strait Islander children to learn the language of their ancestors. “Kids these days are writing their own stories, writing their own books which we put into the collection. If we can get them interested in writing their own stories, that’s fantastic,” Ms Garwood-Houng said. John Paul Janke, who is AIATSIS’ community engagement officer, said many of the 114 languages in their collection are now being revitalised by people tapping into the institute’s broad collection. “The urgency with languages is quite a few languages are spoken by a dozen people and they’re old, so if they’re not documented or taught or passed on then those languages will be extinguished when those people pass away,” Mr Janke said. Also in the institute are 461 Sorry Books compiled in the late ’90s. 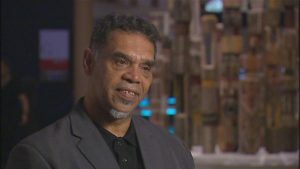 Listed on UNESCO Australia’s Memory of the World register, the books are a physical remnant of the grassroots push to heal the rifts caused by the Stolen Generations. “The Sorry Books were a part of people’s movement to get the then prime minister John Howard to say sorry,” Mr Janke said. Hazel Hawke and Bryce Courtenay were among the list of prominent Australians who signed the book in Australia House in London. ‘It’s not all about the big names though,” Ms Garwood-Houng said.